"The Drowning Part Three: Capitol Crimes" by Dan Abnett, Philipe Briones, and Gabe Eltaeb. 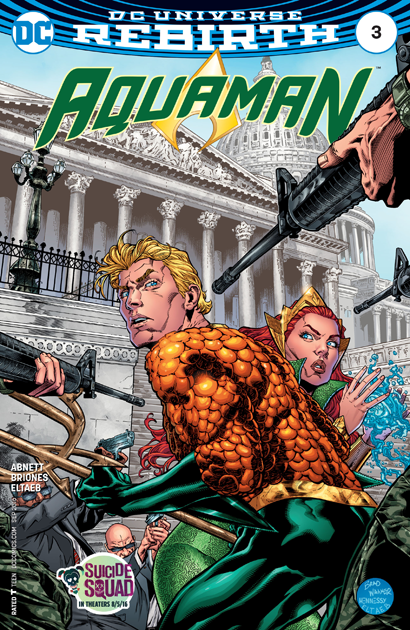 Aquaman is in Washington DC to get Merrick Garland confirmed! 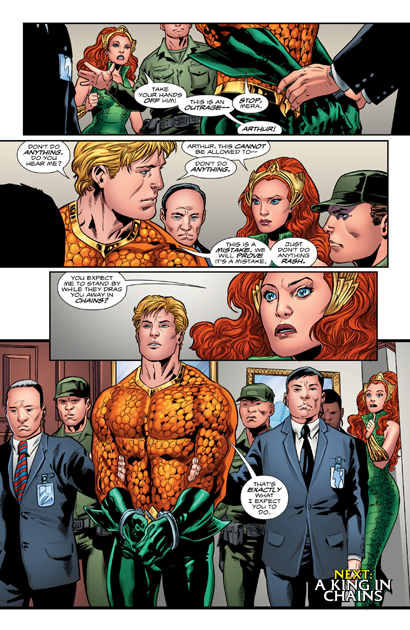 Actually, no, he's dealing with something even harder than Congress: after learning that Spindrift Station has been closed following Black Manta's attack, the Sea King heads to DC to try and fix the situation. Unfortunately, a Navy ship in the South Atlantic is attacked by the Deluge, all in the name of Atlantis. 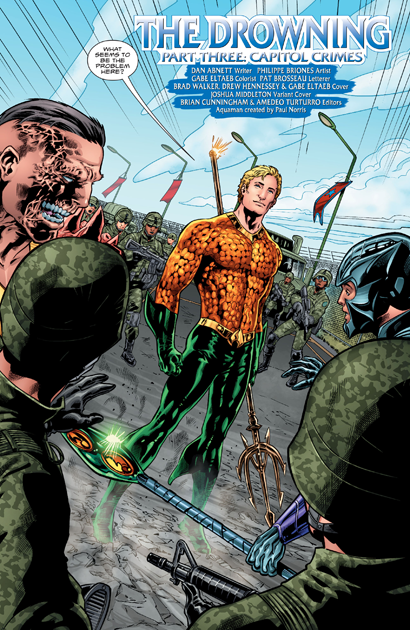 The U.S. Government doesn't take too kindly to this, and they move to arrest Aquaman. 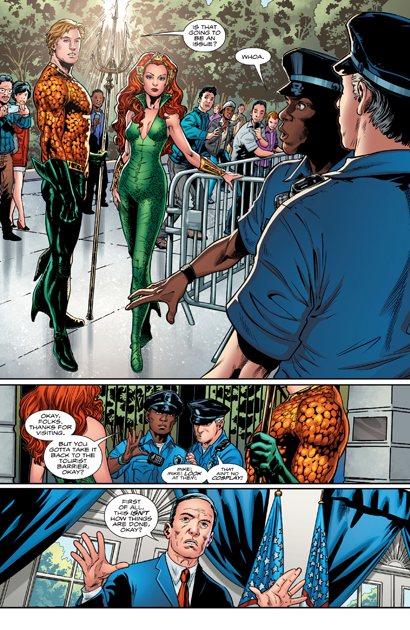 Mera isn't about to just stand there and watch her beloved carted off into chains...until Arthur tells her that's exactly what he wants her to do. After what seemed like a promising start, I'm sad to see Aquaman and Mera have problems with the Surface World again (and so soon!). Arthur even sort of debases himself by suggesting his fellow Justice Leaguer Superman "vouch" for him, all to no avail. At the same time, the band of super-villains who kidnapped Black Manta last issue explain who they are ("N.E.M.O." --cool handle) and after he demonstrates how ruthless and effective he is, he is told he's going to meet "the boss." 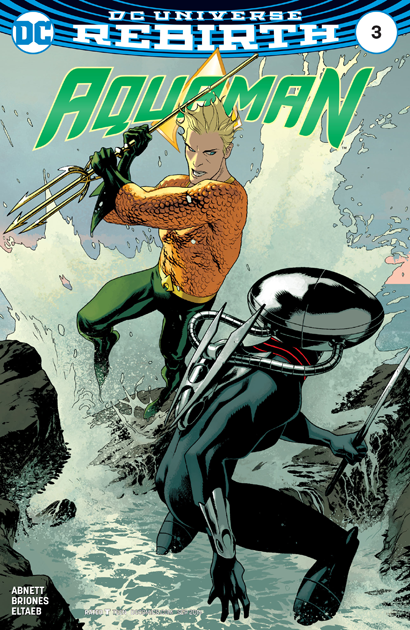 I was a little thrown off by how different Aquaman looks via penciller Philippe Briones--not that he could, or should, just ape what Brad Walker did in issue #1, but I liked that distinctive appearance (seen on the nifty, 60s-esque cover) and missed it this time. But Briones makes up for it with Mera, who gets some great facial reactions--the final two panels show her looking aghast, followed immediately by an almost cartoony confusion. Overall, I'd say this was a fine issue, but not much more than that. Aquaman #1 was such a great start that it was going to be hard maintaining that momentum, hopefully we can get it back for issue #4, in just two weeks. Aquaman #3 is on sale now! I and enjoying the writing with Dan Abnett at the helm. With the 2 issues a month release there is a lot more intricate plot development. I think it will make for a great story once the full story arc completes. If I was the editor I would ask the writer, after this arc completes, to explore one or two issue stories that deal with villains destroying the environment or exploiting the universe of the sea. (and I am pulling this idea from some of the old early days of Aquaman). The dialogue now is so well done and is more realistic than it sometimes had been in the past. Abnett's writing reminds me a little of Gerry Conway in that regard. Keeps the plot moving, easy to ready, but intricate still.